SPIDER VEINS – Cosmetic Concern or Tip of the Iceberg? Spider veins are a common complaint in our vein practice here in Southwest Florida where we have sunny and warm shorts weather year round. Most patients feel this is only a cosmetic concern though that is not true in every case. In some cases spider veins can be a manifestation of a deeper problem called venous insufficiency. Venous insufficiency is a condition where the valves in the superficial venous system in the legs fail and over time lead to impaired blood return to the heart. Blood pools in the leg veins, especially when in the standing or sitting position, leading to abnormally high pressure in the veins or venous hypertension. It is this venous hypertension which leads to the many signs and symptoms of venous insufficiency. Venous insufficiency is a very common and underdiagnosed condition affecting millions of Americans. It is estimated to be present in as much as 40% of the population and becomes more prevalent after age 50. Heredity is the major risk factor, as are a history of blood clots or DVT, obesity, standing or sedentary occupation, female gender and prior pregnancies, though the condition afflicts many men as well. Most people are aware of the most common sign of venous insufficiency which is varicose veins, but many people without varicose veins also have venous insufficiency. Legs swelling as well as achy, heavy or tired legs at the end of the day are common symptoms. Leg cramps, restless legs and excessive urination at night can also be symptoms of venous insufficiency. In severe cases, the skin around the ankles can become discolored, thickened or even ulcerated over time. Spider veins can present in a number of different ways. Sporadic spider veins in the thighs or even the calves can be simply a cosmetic issue. This can be safely managed in the office setting with injection sclerotherapy. This is an effective treatment using a chemical irritant injected with a very small needle into the veins which causes them to sclerose or scar down over several weeks and slowly disappear. It may take several treatments and periodic maintenance therapy to achieve or maintain the optimal results. 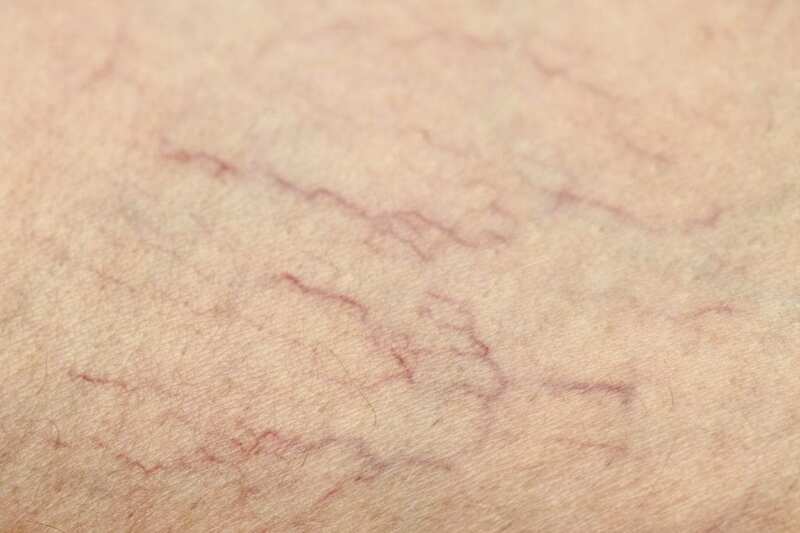 Spider veins can also manifest in clusters or groups, called telangiectasias, or as slightly larger reticular veins. Some patients have a higher concentration and coverage of spider and reticular veins lower down the legs towards the ankles and feet. This can progress to the point of spider veins being nearly confluent and causing the feet to look purple, especially when sitting or standing. Patients with these patterns of spider veins are often related to high venous pressure in their legs from underlying venous insufficiency. At Vein Specialists in Fort Myers and Bonita Springs/ Naples, we offer comprehensive, modern vein evaluation and care. Dr. Joseph Magnant is a board certified surgeon focused 100% on the management of venous disease. We start by taking a detailed history and physical exam in all of our patients including those who may think they only have a cosmetic problem. Patients who have signs and symptoms of underlying venous insufficiency in addition to their spider veins are offered detailed ultrasound evaluations in our office which is the gold standard in evaluating venous disease. We are then able to formulate the best treatment plan for each individual patient. In patients with spider veins who have symptomatic venous insufficiency, it is important to correct the elevated venous pressure in the legs prior to injection sclerotherapy for optimal results. This can be accomplished with an endovenous closure using either a laser or radiofrequency catheter that allows us to heat and permanently seal the underlying poorly functioning veins. This will decrease the venous pressure in the legs and significantly improve vein related symptoms and diminish the spider veins in the lower legs. This procedure is minimally invasive and offered under local anesthesia in both our office locations with minimal discomfort. Several weeks after the underlying venous hypertension has been corrected, injection sclerotherapy can be done to clear up any residual spider veins. If you or a loved one has spider veins or any of the other signs or symptoms of venous insufficiency such as varicose veins, legs swelling, fatigue, achiness, cramps or restless legs, please consider visiting our office. Dr. Magnant sees patients along with our two highly trained nurse practitioners in both our Fort Myers and Bonita Springs/ Naples locations daily so call for an appointment today. Medical adhesive vein closure, VenaSeal™ IS NOW covered by insurance in 2018! Do you have “Orthovenous” Disease? Do you have a leg wound that won’t heal? 1500 Royal Palm Square Blvd. Accepting new patients from Fort Myers, Cape Coral, Pine Island, Iona, Lehigh Acres, Port Charlotte, North Fort Myers, Buckingham, and Punta Gorda. Accepting new patients from Bonita Springs, North Naples, Marco Island, Naples, Estero, Bonita Acres, and Ave Maria. | Ⓒ Vein Specialists 2018-2019. All rights reserved.